Here is what is in our gift basket! Love your favorite things. Would love to win them! I'm a huge fan and would love your cookbook! Thanks for the chance to win. Definitely a fan of the oven mits!! I am a big fan and always look forward to your email updates. 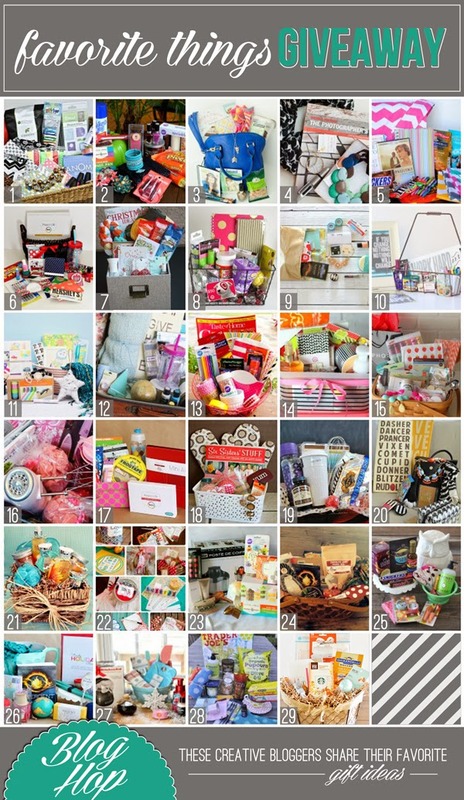 I love these ideas of these gift basket giveaway. Would love to chosen to win one. Love your site and all the wonderful recipes! I would love to win these items! I think it is my turn to win!! Please?! Would love to win your cookbook! I have really enjoyed your recipes, especially the treats. Thanks for taking the time to share. Very good selection of favorite things! I would love a chance to win your book. I love your blog. Great giveaway and I like the cookbook thing. Nice touch. I would love to try Baby Lips--especially w/winter coming! Thanks so much for the giveaway! I would love to win your cookbook!! Love the selection. I love following your blog! Thanks for keeping my family fed. Would love to try it all, especially cookbook and lip balm! I love Baby Lips too! That stuff is amazing! Thanks for the giveaway! The book! The book! The book! My daughter would love some of the items! Your cookbook is adorable - and I'm sure has lots of yummy recipes! Thanks for the chance to win! thank you for a chance to win. I would love that cookbook. Thank you for being so generous -The baskets looks like it has a lot of fun things in it. Love your cookbooks ! LOVE your blog, you gals rock! I WANT the cookbook, love the jewelry too. THanks for the chance to WIN! Great basket! Would love to win your cookbook and that beautiful bracelet! Just met you ladies at the pinners conference in SLC. You are all darling. Would love to win your fav things! Yay!! Would love to win!!! I would love to win this basket!! I think that prze would be awesome to have for my kitchen! Love your stuff! This is so nice! Thanks for the chance! The gift basket is cute, the cookbook alone would be gift enough ;) Love it and your site! Thanks for the chance, would love to have book. Would love to win! I love cookbooks! Absolutely, fantastic give away. Love those cute cupcake liners. I love to bake and would love to win this for my kitchen! I would love love love to win this basket! Thank you for the great giveaway! Thanks for the opportunity. Would love to win! Wow, would love your cookbook, how munch fun!!! I wanted to let you know I follow your blog. I have seven sisters!! Thanks for the offer to win. Thanks so much for giving me the chance to enter... and introducing me to this fun blog sharing giveaway. Cool! :) Would love your cookbook in particular! I saw you at the Pinners Conference. I would love your cookbook! I was going to buy it but, we couldn't find your booth. You are all darling! You girls are my favorite cooks and bakers! Love, love, love the basket! Fun chance to win your book! What a great giveaway! Thanks for the chance, Susie. Love the basket. I think I could even share with my girls. LOVE all the baking things! How fun! Thank you! I already follow your blog, love your basket. Thanks for the chance! Thank you for offering such a great giveaway! Will share with my daughter if I win! Great giveaway! I look forward to you [email protected]! I can't decide which one I would love more - the book or the oven mitts! Ha! For the past 12 weeks I have had to change my way of eating & living. When I saw your posts on Facebook, I had to join!! Being Gluten Intolerant, having ongoing problems with Candida, (due to the loss of my Parotid Gland)& hypoglycemic, I need help with meals, recipes, ideas to share with my family & friends that they will eat This Give Away would be wonderful to win, to help me get started !!!. Oh, I would love to win this !!! I have been Gluten/ Yeast/Sugar Free for 12 weeks now, & need help with meals, ideas, recipes my family will enjoy with out high gluten & sugar. I have Gluten Intolerance, ongoing Candida ( lost my Parodid Glad last yr.) & hypoglycemia. Once I found your sight on Facebook, I new I had to join. I am looking forward to your wonderful posts, ideas, & I love this!!! love your blog, found u on pinterest and just to let u know I have 5 girls and no boys. Wonderful to grow up with your girls, my youngest is now 41 and what an adventure it has been but would not change much of anything! I love your blog page and all of the neat recipes and craft ideas you ladies do together. Love your blog! And your basket! Fingers are crossed. I just love everything on your blog,tried a couple of the recipes last Christmas and would absolutely love to win this basket. I love cookbooks. My friend told me that cookbooks are a waist because everything is online. I totally disagree with her because I love cookbooks.